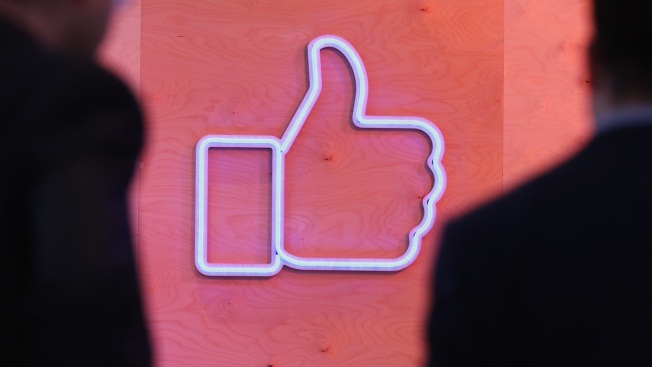 In this February 24, 2016 file photo, people walk past the Facebook "Like" symbol at the Facebook Innovation Hub Berlin, Germany. Facebook, Google and Twitter shared with the Senate Committee on Commerce, Science and Transportation Wednesday steps each tech giant has tekn to combat extremist content in Washington D.C, CNBC reported. All three companies told Congress they went beyond screening, removing extremist content and anti-terror propoganda but also have focused in on targeting targeting people who are likely to be swayed by extremist messages, CNBC reported. Monika Bickert, Facebook's head of global policy management, wrote in an advance copy of her testimony obtained by CNBC that the key to combating extremism was to disrupt the "underlying ideologies that drive people to commit acts of violence," through counterpropoaganda. CNBC reported that Google's YouTube said it will continue to use the "Redirect Method," which sends anti-terror messages to people likely to seek out extremist content through what is essentially targeted advertising, CNBC reported. The tech giants have come under fire in the U.S. and Europe for allowing their websites and programs to be used by terrorists groups and other extremists for recruiting and propaganda, CNBC reported.